An often overlooked but important part of household maintenance is keeping guttering clean. 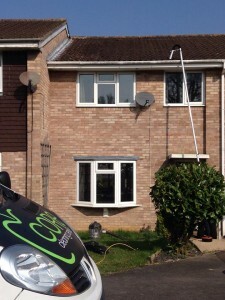 Blocked gutters aren’t just annoying, if they continue to overflow they can cause penetrating damp under eaves which will eventually work its way to the interior of your home. As well as causing permanent damage to your home which will be expensive, time consuming, difficult, and dirty to repair, damp and the mould that grows on it can also be hazardous to your health. Water coming from blocked gutters can also adversely affect your foundations, woodwork such as fascias and window frames and will cause discolouration of the brick and rendering on your walls. If plants start to grow in the guttering, as they often do if they aren’t cleared for some time, they can do an immense amount of damage to your brickwork and roof. 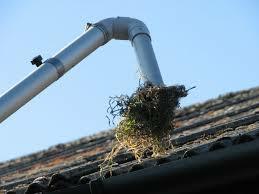 If gutters aren’t cleared they can become full of dirt and organic matter. 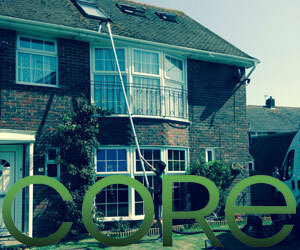 Core Cleaning Services are based in Worthing and cover all of West Sussex and beyond. 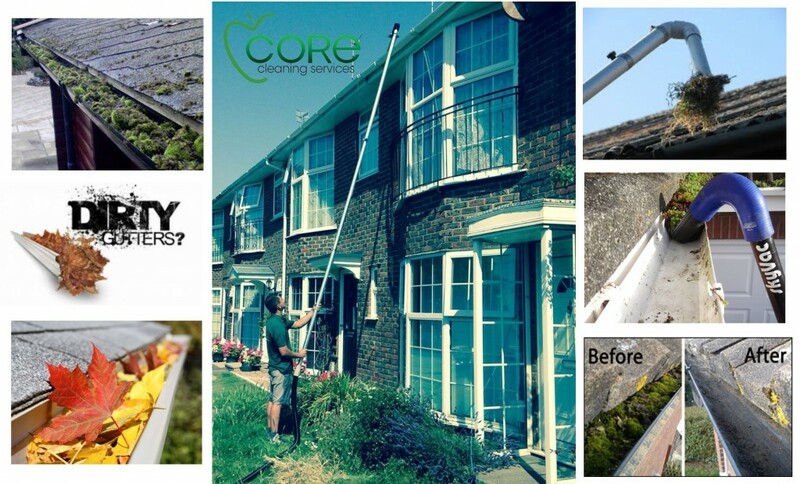 We can clear your guttering astonishingly quickly, usually from the ground, using high pressure telescopic poles and hoses. We find that this is the quickest, safest method as we can dive directly to your property, and clean up without the need of ladders or any other special equipment. 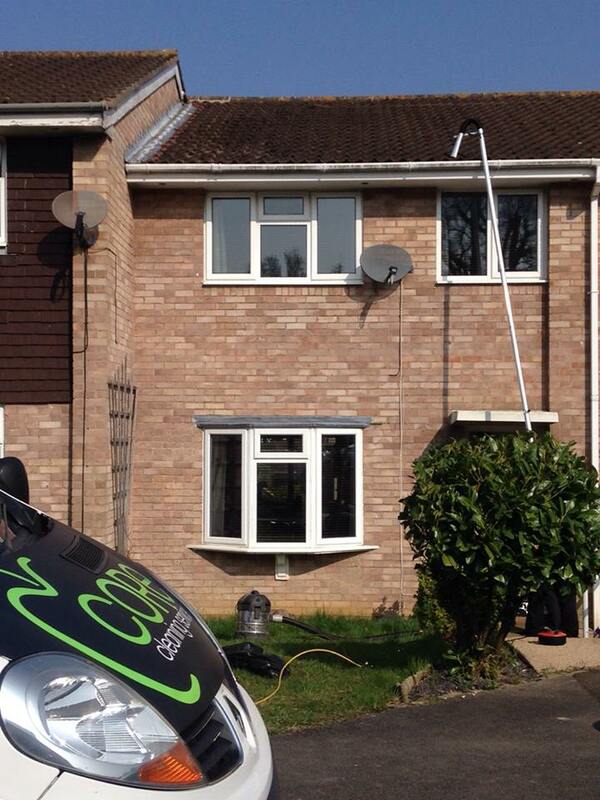 Because we don’t usually need ladders to clear your gutters and downpipes we are able to simply turn up at your home, set up our compressor and get the job done in minutes. 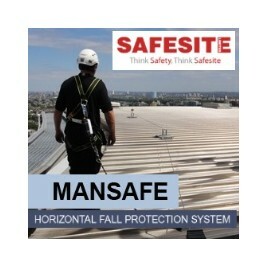 Not only is this exceptionally quick, it’s much safer as there is nobody working overhead. If water is allowed to run over blocked guttering it can ruin flowerbeds and cause minor flooding as the volume of water standing on your property isn’t directed to storm drains effectively. Once your gutters are cleared water can be effectively directed into downpipes and away from your home without running the risk of it causing lasting damage. This becomes increasingly important as we see wetter and wetter winters every year.